Window mats are often used to subtly steer the viewers‘ focus onto pictures, prints and drawings as well as paintings, ideally while remaining unnoticed. 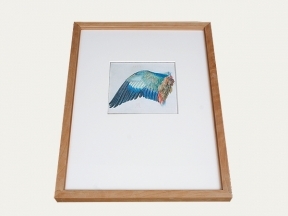 However, what is more important, but only perceptible while handling the object for storage or framing, is the ultimate degree of protection made possible by the unique preservation products we supply. Each individual detail, like a sturdy backing board, a protective cover or lid, or other enclosures specifically designed for archiving, are of primary value as they shield the object resting in its supporting window mat. 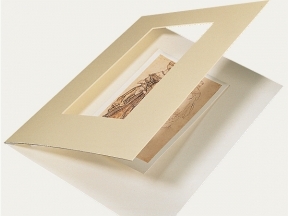 Providing all-around protection to the mount-assembly and of course to the object itself, for example from dust, can be easily accomplished by utilizing our premium quality clamshell box – we would recommend the KS 17 Albertina box or the Premium KS 18 clamshell box for archival storage purposes. Important European collection institutions such as the „Städel Museum“ in Frankfurt or the "Albertina“ in Vienna trust the quality of the products supplied by KLUG-CONSERVATION. We take great pride in the fact that our "conservation board“ was honoured with the Kunsthandel German Art Trade award "Product of the Year“.